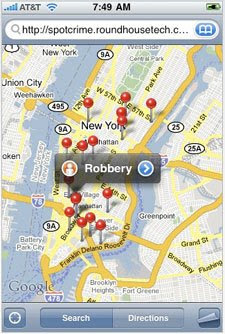 Spotcrime, the online crime mapping site, has released an i-Phone application. The app lets you view a map of your location with recent crime data tagged to the scene of the crime. As well as the Google Maps view of the crimes you can also receive local crime data in the form of a text list. Both the map and list view will tell you how far away the crime took place, how long ago and what the details were. This could prove an invaluable tool when you visit new towns and cities. It could help to show you the areas that it might just be best to avoid.